Joint pain is one of the lesser known symptoms during times of hormonal imbalance, such as menopause. Fortunately, there are things you can do to relieve joint pain. One way is through herbal remedies. Continue reading to discover the top six herbs that can be used to prevent and cure joint pain during menopause. Nettle tea contains a wide range of nutrients, including vitamins A, C, D, and B complex, iron, magnesium, and calcium. 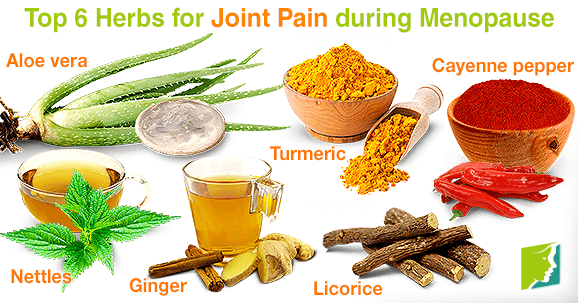 This combination of nutrients produces an herb with anti-inflammatory properties that can help to relieve joint pain. Drinking nettle tea is very popular. Turmeric acts as a natural, but effective, pain reliever due to its curcumin and curcuminoid content. These two chemicals help to decrease inflammation and therefore ease joint pain. Turmeric has a variety uses which can help with joint pain: although it is a popular spice in many recipes, it can also be found as a supplement tablet, and there are several preparations for topical cataplasms. Licorice works to relieve joint pain by decreasing free radicals at the site of inflammation. Glycyrrhizin, a component in licorice, relieves inflammation. Licorice can be found as a supplement or brewed into tea, although it should be avoided by those who suffer from high blood pressure or low potassium levels. Ginger derives its anti-inflammatory properties from the same compounds that provide it with its strong, tangy flavor. Ginger is easily grated and added to a wide variety of dishes, or it can be chopped and brewed in hot water and drank as an herbal tea. Aloe vera is famed in many cultures for its healing powers. Applying and rubbing its essential oil on top of affected areas can quickly soothe pain in joints. Some people also use this herb as an ingredient in recipes or ingest it as supplements, but oral aloe vera consumption can have side effects such as decreasing blood sugar. This is why if you have insulin or dizziness problems, it's best to keep to topical forms. Cayenne pepper is a potent natural way to relieve pain. The “kick” of these peppers comes from capsaicin, a compound that numbs nerve endings, and thus temporarily desensitizes the joints. There are different ways to reap the analgesic benefits of peppers, but the most effective one is to make a poultice and apply it directly on the affected joint. Joint pain can be a painful symptom of menopause, especially when you are also struggling to deal with the other more common symptoms. However, by using herbal supplements such as the six named above, you should be able to garner some relief from suffering joint pain. Schröfelbauer, B. , Raffetseder, J. , Hauner, M. , Wolkerstorfer, A. , Ernst, W. & Szolar, O.H. (2009). Glycyrrhizin, the main active compound in liquorice, attenuates pro-inflammatory responses by interfering with membrane-dependent receptor signalling. The Biochemical Journal, 421(3), 473-482.